For Rodrigo Cabatac, a resident of Semirara Island in Caluya, Antique, imposing an excise tax on coal would be his community’s chance to achieve some form of justice from the environmental degradation caused by decades of open-pit mining in his hometown. “Sa 36 taon ng pagmimina ng Semirara Mining Corporation sa aming isla, walang kahit anong kabayarang nakarating sa amin para sa nawasak naming kabuhayan at kalikasan (In the 30 years SMC has been mining in our island, we have not received any form of compensation for the environmental destruction and loss of livelihood we have suffered),” he says. On December 19, President Rodrigo Duterte signed into law the Tax Reform for Acceleration and Inclusion or TRAIN — the comprehensive tax reform package that aims to raise P3. 77 trillion in revenues for the government by raising levies on sugar-based beverages, gas, automobiles, and coal. It will be the first time since 1976, when The Coal Development Act was signed by then president Ferdinand Marcos, that an excise tax on local coal and an increase on the tax for imported coal will be enacted. “It sends the message that coal is not sacred and may signal the end of the coal era in the Philippines,” former environment undersecretary and veteran climate negotiator Antonio La Viña says. Under TRAIN, the excise tax on coal will increase from P10 per ton to P50 per ton in 2018. The rate will further increase to P100 per ton in 2018 and finally, P150 per ton by 2020. The measure is expected to earn at least P2 billion for the government, the Department of Finance says. However, in the newly signed law, only coal imported from other countries will be imposed the Value Added Tax. Locally produced coal will remain exempt from VAT, which critics say was a missed opportunity for the government to earn more in revenues and rectify a lopsided relationship between business and the public. 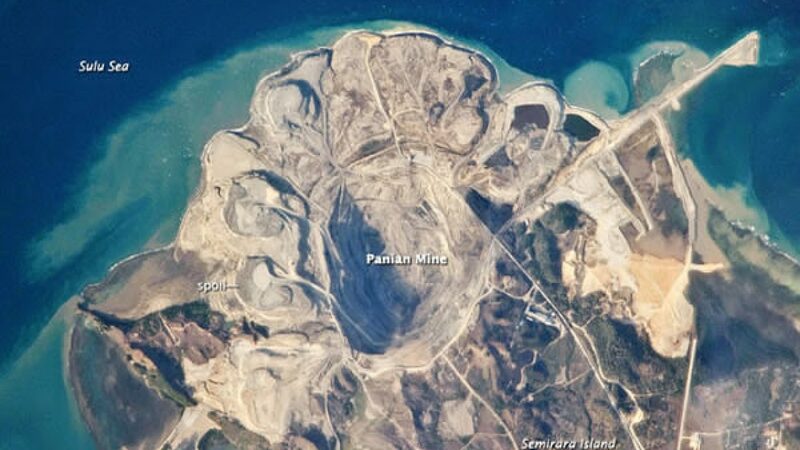 For 36 years, Semirara has been the site of the Philippines’ largest open-pit coalmine. It is a farflung community that is host to highly bio-diverse flora and fauna, with 28 of the 35 known mangrove species in the country found on the island. In 1977, what was then called the Semirara Coal Corporation was awarded exclusive rights by the Marcos government to explore and develop the area for coal mining. The contract would be expanded to 25 years in 1983. The company would go on to mine the Unong pit for 17 years until it was no longer viable. It then moved on to the Panian pit in 1999 and the Himalian area in 2004, which was estimated to hold 120 million tons of coal. While many residents in Semirara have been employed at the mines, residents say the decades-long operations of the company have caused irreparable damage to the community’s ecology and livelihood. During the 1980s, local entrepreneurs in Semirara started to grow commercial seaweed for export. This kind of seaweed is a high value raw material used in the production of cosmetics and food products and is much sought after in European markets. In the following years, residents of Semirara would enjoy a boon in income that would translate to better living conditions such as increased food security, education opportunities, and even protection of coral areas that had been besieged by illegal fishing practices, according to a study by the Philippine Movement for Climate Justice. Seaweed farming employs 30 perecent of Semirara’s population and is also estimated to contribute P400 million to the local economy, the group says. But in 1996, as SMC ramped up its operations, seaweed production declined. Since seaweed are extremely sensitive to pollution, many aquaculture farms were destroyed when black coal particulates surfaced in farms located nearby a coal washing facility. Many seaweed farmers either lost their aquaculture farms or were forced to move their businesses to nearby villages, which came at an expensive price. Many residents were also displaced by the growing privatization of the Semirara coast, the PMCJ says. Civic society groups have criticized the passage of the TRAIN for its potential effects on the prices of basic commodities and services. In particular, Semirara Mining Corporation, the largest producer of coal in the country, had warned the public of the impending increase in electricity rates — already one of the highest in Southeast Asia. While the Philippines relies heavily on coal for its energy needs — 48 percent of its energy mix in 2016 — according to the Department of Energy, locally produced coal only supplies 25 percent of the country’s coal needs. Majority of the coal used in electricity generation is imported from countries such as Indonesia and Australia. Claims that higher electricity prices would be due to higher excise tax on coal are misleading, La Viña says. In reality, the P50 increase per ton of coal would only translate to roughly P8 for households with an average electricity bill of P1,500 per month, the DOF says. Global markets and the volatile price of coal will dictate if electricity rates would go up, La Viña adds. In an interview with Bloomberg News, Isidro Consunji, SMC’s Chief Executive Officer, said the tax plan would not hurt the company’s earnings since additional costs would passed on to consumers. SMC posted a surge in earnings of P4.42 billion in the first quarter of 2017, largely due to rising coal prices in the market. In 2013, amid the surrounding scrutiny on Semirara following a landslide that killed 10 workers whose bodies are yet to be found, residents amplified their calls for the end of the operations of the open-pit mine. Aside from the environmental degradation and loss of income, residents also complained of worsening respiratory health in the once pristine island. Local barangay officials, however, did not agree that the mining operations should be closed since the company employed 2,800 residents, at the time. SMC continues to operate in the island, posting record earnings in 2016. “The passage of the tax on coal in the tax reform bill is historic and marks a big step to rectify the lopsided relationship between coal companies and the Philippine government. However, we have to recognize that DMCI was able to ‘get away with murder’ by lobbying Congress to delete the provision imposing a VAT on locally produced coal,” Gerry Arances, executive director of the Center for Energy, Ecology and Development, says. While the approval of the excise tax on imported coal has been hailed as the Philippines’ signal for more investments in renewable energy, excluding locally produced coal from VAT is seen as an injustice by many residents of Semirara, who have experienced losses of livelihood and health hazards. In 2009, the DOE granted permission to SMC for the exploration of two other islands in the towns of Caluya and nearby Sibay. The agency also granted the extension of the Semirara open-pit coalmine for another 15 years. It will be in operation until 2027. For Cabatac and the residents of Semirara, the transition to renewable energy could not come soon enough.